- instead of Jedward. Though, if you really want a coffee at Ballybrophy these days then you might need to bring a flask. 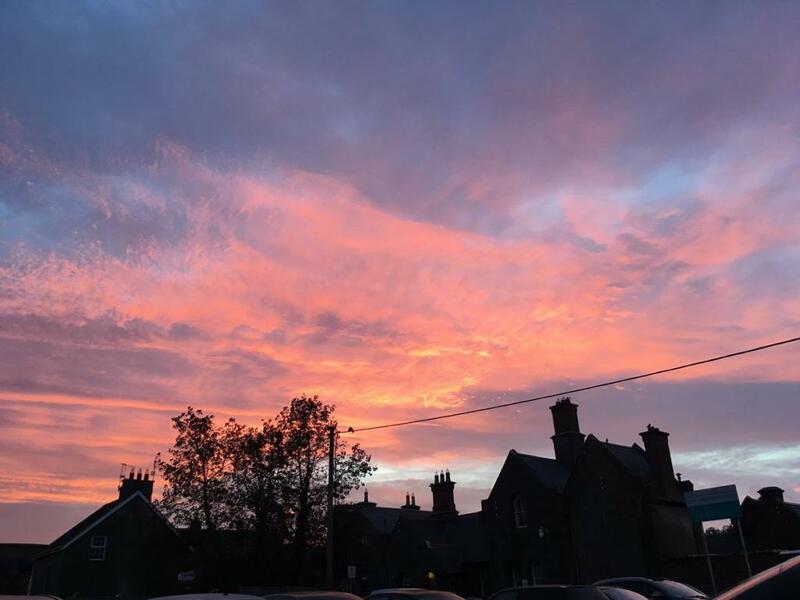 Lambe's and Phillips's are long gone..
My own pictures of the centre of the Universe - https://picasaweb.google.com/105618325540295927305/Ballybrophy# - I have a few more that I'll stick up at some point.. I paused some daycent choons for that, I feel cheated. Super photo. Was a 'direct curve' added to Ballybrophy in recent years that allows trains from Dublin to run direct to Limerick via Roscrea, Neagh, Birdhall? 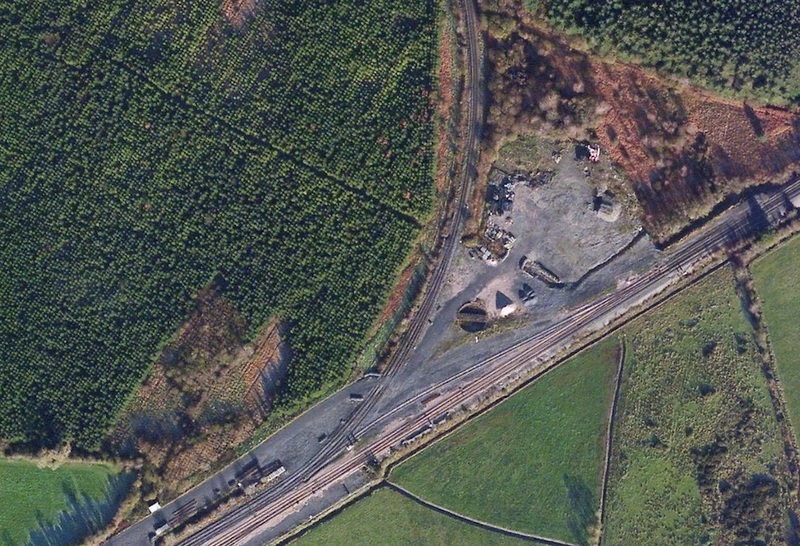 Looking at online aerial photos it looks like the Limerick platform no longer connects directly with the mainline requiring reversing around the direct curve, or have I mis read the map. I don't think so - as far as I can see, you have to reverse in and out of the bay still - though, the loop on the bay platform is gone now. Thanks but like Fr Dougal I'll still a bit confused. There's no direct curve at Ballybrophy. The only reason one would be installed is if there was a reason for trains to by-pass the station completely (i.e. it was closed). Thanks Patrick. That's what I thought. Do you know what the siding pointed to in the photo is for? Pictures and angles can be deceiving but it appears to be heading to intersect the line coming from the bay platform heading north to Roscrea before turning NW? The bay platform used to connect with the main line about there (yellow arrow) but all that track work appears to have been removed. I think the low perspective may be confusing you? As far as I'm aware, the current track is as shown in the vertical view, but without the loop line on the inside of the branch curve. Thanks chaps, that makes sense. The sidings to the north of the mainline, at the other end of the station, have gone now, too. Just the loop round the island platform left. I presume trains consist of DMUs that run back and forth between Limerick and Ballybrophy? 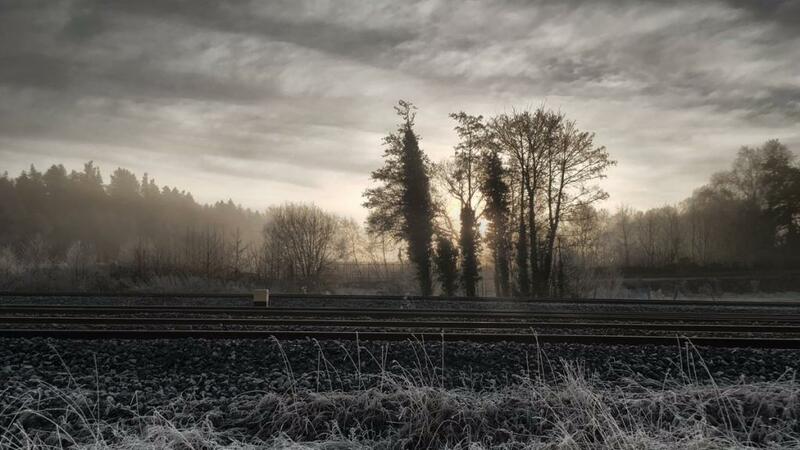 Last summer family took the train from Heuston to Birdhill via change at Ballybrophy, but two friends stayed on the Cork train changing for Limerick at the junction and they arrived 45mins BEFORE the train arrived in Birdhill!!! There must be some speed restriction on parts of that line. Hope they can keep it open. Yeah, everything scheduled on the branch is double ended now, so no more need for running round. It is a very sedate run, the back way.. I got a copy of this today, set in a fictional version of Rathdowney - Chapter 2 describes a journey up to Dublin from Ballybrophy soon after it would have opened, though it is called Ballydermot in the book. Those aerial photos make it look like the bay platform road is not there.....? The Limerick-Ballybrophy line used to be treated as a main-line rated for 70 mph running and the two daily passenger trains running through between Huston & Limerick up to the late 1970s. 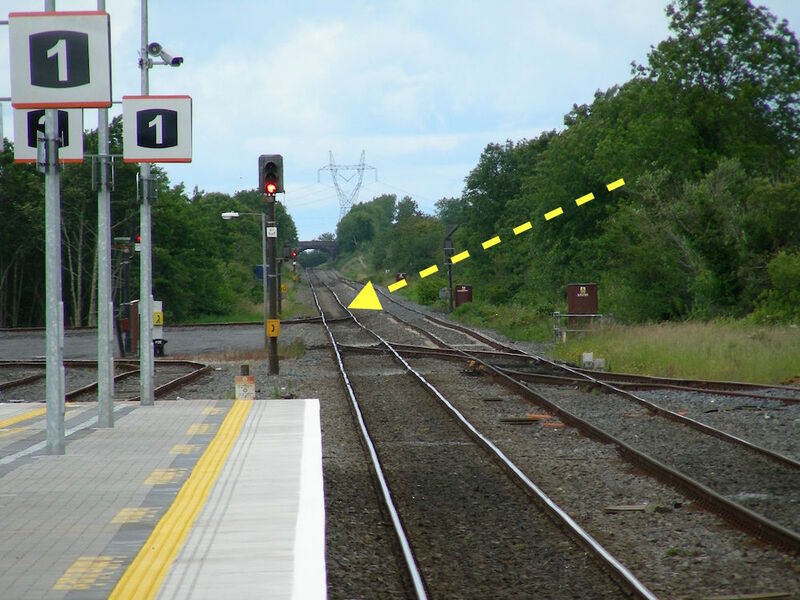 Before the re-modelling a train from the branch could run direct to the three main line platforms, trains ran round on the main line as there was no release from the Limerick bay platform. Trains crossed over from the branch to the island platform by an impressive double slip crossover at the North End of the platform. Not mine - see the Twitter post link below it. Super photo. The distant jet trail adds a nice touch. A style of tree that you don't often find on a layout. Zero and 66½ mile posts. Car parking has become an issue - it's almost back to the main road - there's about another twenty cars not in this shot. It wouldn't be impossible to open up the 'ballast yard' most days, I would have thought. The 'back-slope' of the platforms is a little more obvious now, with the block paving. Even more so from low level. The stainless steel 'bus shelter' has lasted well - note the wheelchair ramp stashed away. The 'new bridge' has some interesting weathering effects. The water crane is beginning to look like it was salvaged from a shipwreck. The two o'clock Heuston-Cork arrives on time, just before three. This unidentifiable one had whizzed through the other way a few minutes before. Some variations in the masonry styles are evident. Is "Hngggg" a good thing or a bad thing. Or are you just typing while exerting yerself?? Or is Hnnng a variation on Danish Interior Design? The folks who use Ballybrophy as a commuter station - are they from quite a number of surrounding towns, does anyone know out of interest? And - are they typically going to Dublin, Cork or elsewhere? I have no real data, but I'm confident that most of them are going to Dublin. The number of cars there seems fairly consistent from day to day. People from nearer to Port Laoise and Templemore would, presumably, use those stations. Southwards there's only really Rathdowney - northwards, there could be a few from Roscrea, perhaps. There are a lot of people that live "in the wilds", as well, of course. I don't actually know anybody who commutes through there - there is a bit of hospital traffic, which is probably fairly steady, though it will vary from day to day. My drop-off and pick-up was for a hospital trip and, as they had to be in Dublin before 9am, we arrived for the 06:40, most of the cars were already there at that time. I arrived back to pick them up from the 15:00 arrival and there were no gaps where cars had left in the meantime. Interesting.....just goes to show that rural station can have a busy life if a decent service is provided. So 89 in Heuston direction, 7 in Cork direction, 25 for Roscrea on, and 3 from Cork direction, 113 from Heuston direction and 23 from Roscrea branch off at Bally in 2015. The figures for 2016 may well turn out to be be a bit higher, based on where the parking has reached now compared to then.